The ongoing edition of the IPL has already been spectacle to a number of bizarre occurings happening both on and off the field. The latest incident to catch the eyeballs of the viewers in IPL 2019 occurred in the ongoing match between Kings XI Punjab and Rajasthan Royals at the AS Bindra stadium in Mohali where three runs were awarded to the batting side despite the batsman getting cleaned bowled. It all happened on the second ball of the 17th ball of the over when Miller was clean bowled by a pacy delivery from Joffra Archer. It was angled into the stumps and Miller went for the blind slog but ended up missing it altogether. The ball crashed into the stumps and Archer had started celebrating the wicket only to realize that it was given as a no ball by the on field umpire. The ball went all the way down to the third man region and the batsman ended up running three to add insult to injury. It was awarded as a free hit in favour of the batting side. It was Rahul on strike as the batsmen had changed ends in going for the third run which meant that there could be a change in the field placements. Rahul however failed to make any use of the free hit delivery which ended up being just a dot ball. 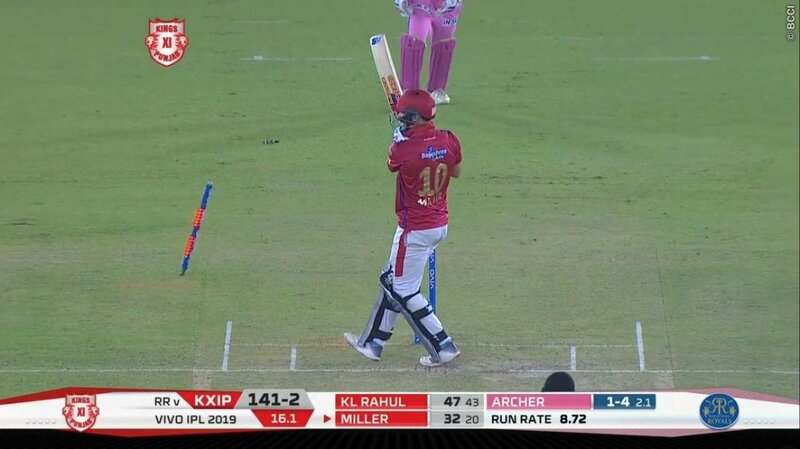 It was another brilliant well directed inswinging yorker from Archer and all Rahul could do was dig it out at the last moment, much to the respite of the fielding side.